Rain causes flooding along Israel's coast, with thunderstorms causing power outages in northern cities. Rainfall on Wednesday morning caused flooding in the southern cities of Sderot and Ashkelon, with cars sinking into the water. Sderot resident David Mansour told Army Radio, "The entire city has turned into Venice. Everything is flooded, the playground and ten cars are sitting in puddles. No one enters or leaves the marketplace. The infrastructure is old and we haven't invested in it, we invest only in cosmetics. So now you have rain, and this is what happens." Rain also fell further north along the coast, as well as in the western Galilee, with strong rainfall and thunderstorms overnight. In the northern cities of Ma'alot and Karmiel, the storms caused power outages. 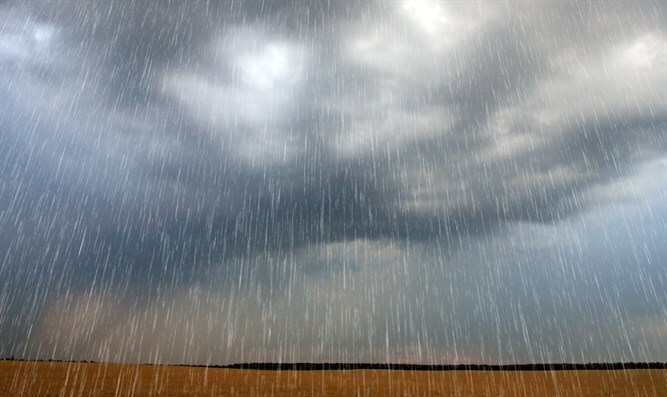 Ashkelon has received 35 millimeters (1.38") of rain, while the Sharon region and the central city of Rishon Lezion received 8 millimeters (.31") of rain. Wednesday will be partly cloudy. Local rains may fall until the afternoon, from northern Israel to the northern Negev. There may be isolated thunderstorms, and flooding may occur in the Judean Desert and near the Dead Sea. Temperatures will remain stable. Wednesday night will be clear or partly cloudy. Thursday will be clear or partly cloudy, with a significant rise in temperatures, especially in Israel's inland and mountainous regions. During the afternoon, local rains may fall in northeastern Israel. Friday will be pleasant with a slight rise in temperatures.